Thermal energy storage incorporated into the fabric of buildings could provide the opportunity to significantly improve the use of energy from renewable sources and take maximum advantage of off-peak electricity tariffs. If this kind of thermal storage is integrated into the structure of the building itself, the internal space of the building is not compromised and may be more cost-effective. In this paper, the authors present a taxonomy of currently available fabric-integrated thermal energy storage solutions based on a review of existing literature. The aim of this study is to map the range of extant design solutions for fabric-integrated thermal storage in buildings and detect any omissions. The taxonomy presented in this paper takes into consideration the interaction between the storage of thermal energy and the thermal zones of buildings, the methods and medium used to store thermal energy, and the storage temperature. Also considered here are the different architectural integration options, which the authors present through a catalogue of possible thermal energy storage locations. This paper also argues that an active storage system provides a means for energy systems in buildings to actively participate in future energy networks, which may require active load management to accommodate a high proportion of renewable technologies. Active storage allows the charge and discharge of the thermal energy stored within buildings when the energy is available and/or economically valuable. This kind of active participation is not possible with passive storage techniques. The integration of Thermal Energy Storage (TES) in buildings can temporally decouple when devices such as a heat pumps or chillers operate and when the heating or cooling is provided to the end user; this can radically alter the timing of a buildings’ energy demand, potentially enhancing the use of renewable energy resources (Lehmann et al., 2007). Storage allows potentially cheaper, off-peak energy supplies to be exploited (Basecq et al., 2013) and it can also act as a means to collect local energy resources (AIA-Research-Corporation, 1976). However, many obstacles exist with regards to integrating and operating heat storage systems in buildings. One of the most significant is competition for space–as dwelling sizes reduce (Robert-Hughes, 2011), floor area is at a premium and the space penalty associated with conventional technologies such as hot water storage can act as a barrier to its uptake. This problem becomes more acute if the operation of future networks necessitates the need for heat to be stored over longer time periods than is done at present (Reynders et al., 2017). Storage in the future may need to migrate away from the traditional hot water tank at seen at present, towards media such as phase-change materials and storage that makes better use of the existing space and thermal mass in and around buildings, including large scale community storage. Fabric integrated thermal storage (FITS) stores heat in structural or constructional elements and therefore does not compromise internal space. However, the effective operation of FITS, within a building, possibly featuring multiple heterogeneous heat sources and active energy network participation, raises significant engineering and social challenges. For example, heat stored in the building fabric needs to be effectively insulated if excessive losses are to prevented, and to prevent overheating which could be a problem in modern, well insulated dwellings. FITS would need to be integrated and operated with existing energy systems. Finally, operating local storage as a means to improve the operation of external energy networks (in addition to servicing the needs of the local building) would not be attractive to building owners unless if they were financially disadvantaged or subject to increased discomfort. The FITS-LCD project, funded by the UK Engineering and Physical Sciences Research Council, is addressing many of these questions, researching the effective integration and operation of fabric integrated storage within the context of wider energy networks and diverse local energy supplies. The project focuses specifically on the domestic sector and this paper reviews the existing options for storage integration with the aim of developing a new taxonomy of FITS to identify available design alternatives, and consequently, highlighting the omissions that represent new potential concept designs. Thermal energy can be stored physically as sensible or latent heat. The first approach is based on the specific heat of the storage material, such as concrete or hot water, while the second one is based on the heat of phase transitions (Cabeza et al., 2015) (e.g. solid-liquid or solid-solid). Depending of the storage temperature, FITS can be coupled to or decoupled from the building interior depending upon insulation level and location within the building. The storage temperature is a key element on a FITS system and has multiple implications on the system design since the available charging and discharging options, as well as working fluid, are dependent on this (Figure 1). Charging and discharging of FITS, can be passive or active, however active systems provide the opportunity to operate with higher and greater range of storage temperatures than passive systems. With passive storage, the heat is stored without mechanical input, using solar gains, convection or temperature difference; whilst active systems require a system for heat generation and transfer to/from the store. Passive storage systems or technologies are normally integrated as part of the building structure. This is the case in sun spaces, exposed thermal mass or shading devices (Navarro et al., 2016a). In an active storage system the heat is transferred using a distribution medium, such as air or water, with forced convection (Navarro et al., 2016a), or by using electricity. Air and water based-systems can either be used for cooling or heating while direct electric systems are used for heating. In some cases the charge and discharge can be a combination of active charge and passive discharge or vice versa, and the thermal energy can be stored in a HVAC system, in the building fabric or outside the building structure (Heier et al., 2015). Storage temperature and systems options. There are a small number of reviews on thermal storage systems in buildings, with some reference to the potential of FITS. Basecq et al. 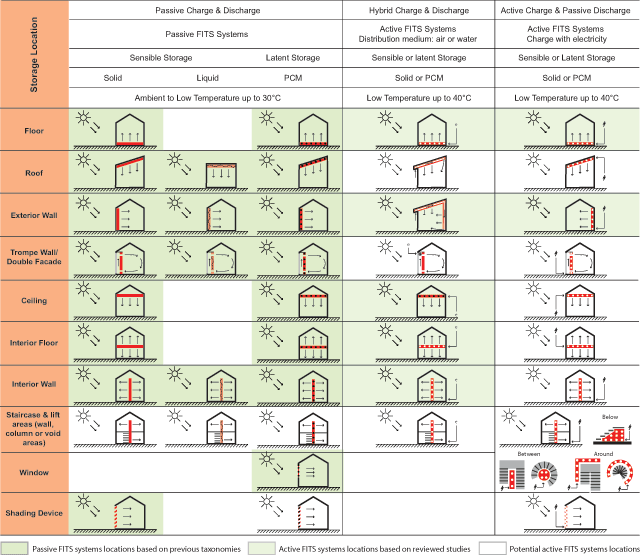 (2013) present a review on short-term storage systems for buildings based on concepts such as passive and active systems, storage materials and system performance. Heier et al. (2015) focus on combining TES in residential and commercial buildings by reviewing storage technology such as passive and active systems. Navarro et al. (2016a) and Navarro et al. (2016b) reviewed passive and active TES systems that are integrated in buildings, and classify the integration based on the storage location. Considering the above works, this paper addresses the application of passive and active FITS in buildings through a taxonomy of extant designs solutions. This is done to identify existing solutions and omissions in this range of designs. A taxonomy of FITS systems catalogues how TES can be integrated in the building fabric. However, to classify these systems, it is necessary to map where and how the TES can be integrated. The AIA Research Corporation (1976) provided one of the first storage taxonomies, presenting a set of diagrams of passive FITS systems, illustrating different storage methods, materials, locations and thermal energy distributions. Mazria (1979) and Anderson (1984) validate these initial diagrams by producing new illustrations based on a review of research on passive FITS systems. Later, Howard and Fraker (1990) developed an expanded taxonomy by illustrating passive FITS systems with direct, indirect and isolated gains. Focusing on the application of phase change materials (PCM) in buildings, Zhang et al. (2007) present illustrations of latent storage in passive FITS systems. In these initial taxonomies, a considerable amount of the sensible storage with solid materials is integrated into the building fabric. This integration is included in structural elements such as walls, floors, roofs and foundation walls. Or in interior elements such as internal walls, vertical solar louvres, internal floors or ceilings. FITS systems with liquid storage material are integrated in external or internal walls using filled-water drums, tubes and transwalls. Similarly, these systems are included on roofs by using filled-water bags. Passive latent heat storage systems are located in walls, floors, roofs, ceilings and windows. However, these taxonomies are limited to passive FITS systems, and therefore a new taxonomy that includes active FITS systems is necessary. As part of this study a new, more comprehensive taxonomy has been developed by examining multiple parameters, such as storage location, type of storage material, type of charge and discharge options, and type of storage temperature, against the existing taxonomies and the research studies examined in this paper. This methodology offers the opportunity to produce a system categorisation through the schematic representation of currently available FITS solutions and, consequently, identifying any omission on existing studies. For these omissions, examples of new potential design concepts for FITS and additional comments are provided. For the locations, the new taxonomy took into consideration structural elements such as floors, roofs, external walls and foundations; internal elements such as interior walls and ceilings; and elements such as windows, shading devices, adding new locations such as staircases and lifts in multi-storey dwellings. The storage systems in this paper are organized and presented as coupled, and semi-decoupled and decoupled systems, based on the relation of the storage to the internal zone of the buildings. This division is linked with the storage temperature, which follows the scale and nomenclature presented in Figure 1. The coupled FITS systems include passive and active systems while the semi-decoupled and decoupled FITS systems are mainly active. The majority of previous studies describe coupled storage systems. There is preponderance for studying active systems, with air and water as the distribution fluid (rather than using electricity). The studies either employ sensible or latent storage, and most sensible storage use concrete as the storage material. TES active systems in buildings are not a new concept. 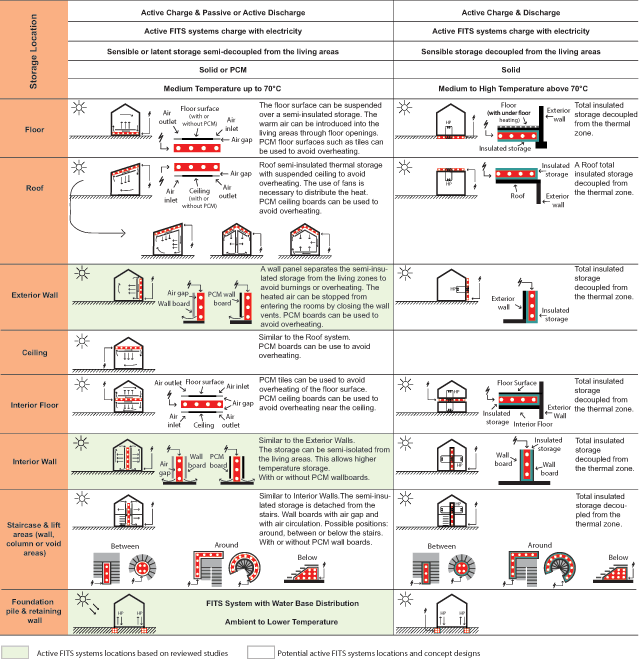 In ancient Rome the hypocaust and murocaust were used for building heating, and similar concepts that also use air as the heating fluid such as the Chinese Kang and the Korean Ondol systems are still used (IEA-ECBCS-Annex44, 2009). Chen et al. (2010) studied a ventilated concrete slab (VCS) integrated into a low energy solar house. The thermal storage was charged using warm air collected by a roof photovoltaic/thermal (BIPV/T) system, and the heat was released by passive means. It was found that in winter, on a clear day and with outside temperatures around 0°C, the VCS was able to store 9.12 kWh of heat. It was also able to store thermal energy during several clear sky days in March without overheating. Ekrami et al. (2015) also studied a VCS that works in conjunction with a ventilated sand bed accommodated under the VCS, and both systems stored thermal heat from the BIPV/T, which later was used to preheat an air-to-water heat pump system. The heat pump supplied the heated water for space conditioning using the hydronic floor and walls, and for domestic hot water. The preliminary thermal analysis showed that the hydronic walls could be used for thermal energy storage using a BIPV/T and air source pump system. Chen et al. (2016) studied the thermal performance of three different configurations of ventilated building-integrated thermal energy storage systems, which could be implemented on walls and on floors. The systems were reported as being able to improve the thermal performance of the zone with reduced energy consumption due to the thermal energy stored. Through an experimental investigation, Dermardiros et al. (2015) looked into the use of latent thermal energy storage system in air ventilated panels. The system contained a macro-encapsulated PCM panel that was activated using warm or cold air, which flowed along the panel core. This design could be implemented as partition walls or could be incorporated as part of a ceiling. Columns are a potential location for thermal energy storage. Unalan and Ozrahat (2014) looked into this structural element by investigating the use of multi-storey buildings columns for heating. The vertical thermal storage has active charge and passive discharge, by using stainless steel pipes embedded on concrete columns with circulating heated air. It was found that at winter the charging time to achieve the required heat loads value for a flat was dependent on air temperature and airflow velocity values. Hydronic systems were initially utilised during the 1930’s in Switzerland, by embedded steel pipes in concrete floors (IEA-ECBCS-Annex44, 2009). Later, in the 1990’s in Mid-Europe, these systems appeared as an energy efficient and economic possibility for heating and cooling of buildings (Lehmann et al., 2007). Reynders et al. (2013) compared the use of a hydronic floor and a wall radiators system. The study assessed the use of electricity for heating and the application of local electricity production through storing thermal energy into the building structure. The floor heating system provided the lowest energy needs and had the lower internal air temperature oscillations. Several studies focused on the use of latent thermal storage. Through an experimental investigation Zhou and He (2015) compared four systems with different thermal storage, such as latent (PCM) and sensible (sand), and with different heating pipes such as polyethylene coil and capillary mat. The polyethylene coil was formed by pipes with a diameter of 20 mm that were spaced by 140 mm intervals. The capillary mat was made by thin plastic tubes with a small diameter of 4.3 mm which were arranged within 40 mm distance between each other, allowing a greater heating transfer area. The authors found that the capillary mat could provide room temperature within comfort zone in a shorter period of time that the polyethlene coil. Also through an experimental investigation, Zhang et al. (2016) considered a new radiant floor system with solar collector and a vertical latent thermal energy storage device. This study showed that the system was able to improve the indoor thermal comfort under different winter weather conditions, providing temperatures of 5°C to 7°C higher than a room with no heating. The vertical latent energy storage device could store excess solar energy for two consecutive mornings, and could increase the usage of solar energy by 30%. The system was self-sufficient when the received solar radiation was greater than 15 MJ/m2. Several researchers investigated the performance of hydronic walls using different heat sources. Li et al. (2016) studied the energy saving potential of an exterior wall system that used a ground source heat exchanger to charge the system with cold or heated water, while the discharge was passive. It was reported that the heat loss and gains through the walls were minimized due to the water temperature of the system. However, the soil temperature in different climates had a great effect on the system’ energy saving potential. Romaní et al. (2017) undertook an experimental study on a radiant heating system in a heavy brickwork wall with a ground source heat pump. It was found that the radiant wall produced maximum energy savings of around 40% when using a set point of 22°C. The system was able to operate with off-peak electricity but, because of the slow response, this system was not able to operate intermittently. Atienza Márquez et al. (2017) explored the use of a radiant floor heating system combined with a fan-coil heating system. It was reported that the system was able to provide good thermal comfort during the heating season, and produced the best performance when both heat distribution systems work co-operatively. Through an experimental study Koschenz and Lehmann (2004) tested a thermally activated latent storage ceiling panel with passive discharge. This panel could be incorporated in lightweight constructions or used in retrofit projects. It was found that due to high latent thermal capacity of the paraffin, 5 cm microencapsulated paraffin (25% by weight) and gypsum could provide good thermal comfort in an office building. It was concluded that ventilation strategies such as night cooling could be used with this system. Various studies investigated use of off-peak electricity to charge the FITS, and some of these researches combine active charge and passive charge by using direct solar gains. Through a numerical model, Athienitis (1997) investigated the thermal performance of a radiant concrete floor heating system with direct solar gains. The author reported that by increasing the floor thickness from 5 cm to 10 cm, the heat demand was reduced by around 20% but the surface temperature was 1.5°C higher than the allowable temperature of 29°C. However, when the system was fully charged during the off-peak periods, additional direct solar gains during the day could cause overheating. This could be avoided by increasing the thermal mass or by using individual night and day set points. Athienitis and Chen (2000) studied the heat transfer in floor heating systems using a three-dimensional model. The thermal performance of storage material such as concrete and gypcrete was investigated, as well as the effect of full or partial floor coverage using hardwood or carpets. It was found that a surface area with sun exposure could reach temperatures up to 8°C higher than a shaded floor surface area. It was also reported that the energy demand could be reduced through the solar passive gains received by the storage system, with energy savings ranging from 32% up to 53%. Research on the thermal behaviour of electric heated floors was conducted by Amir et al. (1999) using a mathematical model. The study compared the thermal performance of a sensible storage with a latent storage charged with off-peak electricity. Both thermal storage systems were in a concrete structure, the sensible storage used water while the latent storage used paraffin. It was reported that the latent storage showed greater thermal storage capacity with a reduced amount of volume, with a daily storage surface amplitude temperature of 1.3°C, while the sensible storage value was 3.8°C. Through a simulation study, Li et al. (2009) also investigated an electric floor heating system combined with a latent heat storage. The system was charged with off-peak electricity and the discharge was passive. It was found that the new form-stable PCM storage provided good temperature regulation with energy costs reduction, and that the system performance was affected by the heating mode and the latent storage thickness. Recently, a thermal energy storage system composed by an electrically heated floor for building load management was investigated by Thieblemont et al. (2016). The parametric study using TRNSYS examined concrete thickness, and also the location of wires and insulation. It was reported that in a cold climate, an electrically heated floor system could use up to 84% of the energy load during off-peak periods, while providing good thermal comfort. Concerning the system design, it was found that insulation below the storage reduced heat losses to the ground, while using insulation above the storage increased the heat losses to the ground and prevents heat transfer to the room. Regarding the system performance, it was affected by the location of the electric cables and storage thicknesses but values greater than 18 cm had no additional benefit. LeBreux et al. (2009) proposed a controller to operate a hybrid storage system based on anticipatory and regulation strategies. The storage system had an interior wall with embedded electric resistance and an adjacent sunspace. The system stores solar heat through passive charge, and off-peak electricity through active charge. The authors reported that the controller shows superior performance than traditional control systems. The storage system was maintained with a constant performance, and within the thermal comfort range. The electricity demand for space heating was reduced of which 95% was off-peak electricity. The new, comprehensive taxonomy of coupled FITS systems, illustrated in Table 1, was developed by considering where and how TES can be integrated into the building fabric. It used parameters such as storage location, temperature, material and change and discharge options, and it included passive and active systems. The taxonomy of passive FITS systems is developed from the existing taxonomies, while the taxonomy of active FITS systems is developed from active storage research studies. The new taxonomy clarifies what locations and systems are more commonly used. Therefore, it allows to clarifying the present opportunities to develop new coupled FITS concept designs. Taxonomy of FITS – coupled storage systems. The passive systems that use storage temperatures ranging from ambient to low temperature up to 30°C are presented as sensible and latent storage systems. It was found that most locations and storage methods (such as sensible and latent storage) were categorised in previous taxonomies. The novelty of this taxonomy is that compiles the preceding taxonomies, and consequently, provides a clear summary of what has been studied regarding passive FITS. Regarding the active systems, this taxonomy resolves the lack of categorisation of these storage systems. The active coupled systems include low storage temperatures up to around 40°C and are presented according with the storage activation process and, therefore, organized by distribution medium, such as air and water, and electricity. It was found that a greater number of studies use air or water in comparison with the number of studies that use electricity. For this reason, it was verified that there is a greater opportunity to investigate active FITS systems that uses electricity to charge the storage. Some options for possible new locations to be studied are identified on the taxonomy (e.g. ceilings, suspended floors and internal walls). Concerning the storage methods, the review indicates a good balance between the number of storage options that use sensible and latent storage. However, it was apparent that most of the studies that use sensible storage employ concrete as the storage material. The potential advantage of a semi-decoupled and decoupled system is that storage temperatures may be much higher without leading to overheating and thus the potential amount of storage is increased. In a FITS concept, this may be advantageous in terms of having higher storage capacity and an ability to control both charge and discharge to maintain thermal comfort and control the condition of the store. Foundation piles and retaining walls which are part of a building foundation are below-ground thermal energy storage systems and are decoupled from the building thermal zones and work as the heat exchanger. Generally, the energy source is geothermal when an energy foundation pile length is greater than 20 m. These systems also work as a storage medium. However, as pointed by Loveridge and Powrie (2013), in the case of concrete piles most studies do not consider the heat storage potential within the pile. These systems work with ambient temperature storage that is dependent on the mean ground temperature of a particular location. Nevertheless, there is a great potential to use medium to high storage temperature values. Through an experimental study Wood et al. (2010) analysed the heat pump performance and ground temperature of piled foundation system for residential buildings. This system used 21 concrete piles with 10 m depth each. During the heating season, it was found that seasonal performance factor of the heat pump was 3.62, and the piles no longer affected the ground temperature at a distance of 5 m. Moon and Choi (2015) also analysed the heating performance of a ground source heat pump with energy piles and energy slabs. The energy pile system of 150 piles with a depth of 13.8 m, while the energy slabs had 10 horizontal pipes with a length of 180 each. It was found that the heating capacity of these systems exceeded the expected capacities. The minimum coefficient of performance of the heat pump was 4.2 for energy pile system and 4.5 for the energy slab system. Recently, the use of a thermo-active diaphragm wall was investigated by Sterpi et al. (2017). It was reported that the retaining wall system benefited from the large surface in contact with the ground. It was found that the thermally induced mechanical effects do not seem to be harmful to the geotechnical and structure safety. However, this research points out that its use requires further studies to avoid unanticipated overstress conditions. Laouadi and Lacroix (1999) used a mathematical formula to study the thermal performance of a latent heat storage unit with electric heat source, which worked as a ventilated heating panel with active charge and passive/active discharge. The units could be applied on horizontal or vertical surfaces, such as ceilings or walls. This system used two types of heat discharge: a forced convective heat that occurs with the air passing through an air channel, and a passive radiant heat discharge from the panel that separates the storage unit from the living space. The system operational temperature was set between 35°C and 50°C. It was report that the unit could be used to store electric energy as thermal heat during off-peak periods providing sufficient heat for the living areas. Lin et al. (2005) proposed an underfloor heating system with PCM. The system stored thermal heat using off-peak electricity, the storage temperatures were between 55°C to 70°C and the discharge was passive. It was found that the system could provide a uniform indoors air temperature and it was confirmed that off-peak electricity could be used to charge the latent storage. The new taxonomy of semi-decoupled and decoupled systems is illustrated in Table 2. The semi-decoupled systems use medium storage temperatures up to 70°C with electric activation, while the decoupled systems are best used with temperatures greater than 70°C. The number of studies on FITS with medium storage temperature values up to 70°C are limited and there is a lack of research using values above these. Taxonomy of FITS – semi-decoupled and decoupled storage systems. By increasing the storage temperatures the storage capacity increases, moving from short-term or small period such as hours to longer energy storage periods such as days or weeks. However, the TES system has to be thermally decoupled from the living areas since the parasitic losses from the storage system will contribute to unwanted losses from the system and possible heat gains to the living spaces. Therefore, the FITS requires a greater level of insulation and the mechanisms to charge and discharge have to be active. 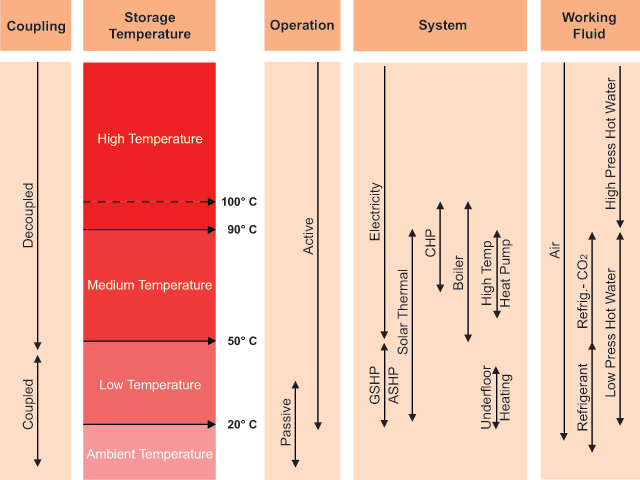 Consequently, the possible locations for fabric integration are reduced when the storage temperature shifts from ambient and low temperature (Table 1) to medium and high temperature (Table 2). Nevertheless, it was found that the potential for new research is greater due to the lack of studies examining the use of higher temperature storage and, additionally, these systems can be linked to the grid allowing active participation of thermal storage. This taxonomy of semi-decoupled and decoupled systems adds new storage concept designs as examples of possible options for future studies. In the case of semi-decoupled FITS system, it exemplified possible locations to implement a ventilated storage charged with electricity. Whereas in the case of decoupled storage, it demonstrated the possible locations to implement a solid storage charge with electricity, and further alternatives are charging the storage using high temperature heat pump or CHP systems (Figure 1). Thermal energy storage (TES) in buildings has the potential to contribute to more efficient and lower carbon energy sources, by maximising the use of renewable energy sources and allowing the use of off-peak electricity tariffs. To allow control of the system fabric-integrated thermal storage (FITS) can be coupled or decoupled from the building’ thermal zones based on insulation levels and positions. Decoupled TES allow higher temperature storage, which results in a greater storage capacity but also requires active charge and discharge. Active FITS systems can be changed using distribution fluids such as air and water, or by using electric resistance heating. This review indicates that most research on FITS has focussed on coupled systems and the majority of the studied systems use air and water has as the distribution medium. Therefore, the number of studies that use electricity to charge a FITS system is comparatively small–the greater the storage temperature, the fewer are the available studies. The majority of the studies that employ sensible storage use concrete as the storage material, and some of the studies compared or combined sensible and latent storage. This taxonomy illustrates that the number of possible locations for FITS decreases when the storage temperature increases from ambient to high temperature values. However, these are of interest. Firstly, there is a lack of investigation into semi-decoupled and decoupled FITS with higher temperature storage. Secondly, these systems will require additional research on insulation design to avoid excessive parasitic losses. Lastly, since the charge and discharge are active, new control mechanisms can be investigated for both change and discharge which may have benefits to energy supply systems and the building users. Contrary to passive storage techniques, an active storage system offers an opportunity for active participation in the energy network. It allows the charge and discharge of FITS systems when the energy is available and/or economically valuable. In summary, the methodology presented in this paper is used for developing a visual representation of FITS, combining a simplified representation of existing systems and a notation scheme of new potential design concepts. The new taxonomy revises and provides a condensed version of passive FITS systems previous taxonomies, and proposes a new categorization for active FITS systems that is based on the studies reviewed. As a result, the new taxonomy can be used as a tool to clarify where and how passive and active TES can be integrated into the building fabric. This study can also provide as guidance in identifying new potential solutions for active FITS concept designs. This work was supported by the Engineering and Physical Science Research Council (EPSRC) under grant EP/N021479/1 – Fabric integrated thermal storage in low carbon dwellings. AIA-Research-Corporation 1976 Solar-dwelling design concepts. Washington. Anderson, B 1984 Parte one. New York, Van Nostrand Reinhold. Howard, B D and Fraker, H 1990 Thermal energy storage in building interiors. In: Anderson, B (ed. ), Solar building architecture, 147–256. Cambridge, Massachusetts: The MIT Press. IEA-ECBCS-Annex44 2009 Expert guide–part 2 responsive building concepts. Norway & Italy. Mazria, E 1979 The passive solar energy book. Rodale Press. Robert-Hughes, R 2011 The case for space: The size of england’s new homes. London, Riba-Report.